Timothy J. Reiss is Emeritus Professor of Comparative Literature at New York University. His most recent books are Against Autonomy: Global Dialectics of Cultural Exchange (2002), Mirages of the Selfe: Patterns of Personhood in Ancient and Early Modern Europe (2003) and the edited collections Music, Writing and Cultural Unity in the Caribbean (2005) and (co-ed.) Topographies of Race and Gender: Mapping Cultural Representations (2008-9). He is currently finishing a book on Descartes and his age’s political practice and thought, another on rethinking the Renaissance as part of long continental and oceanic intercultural exchanges, and an edited collection on Ngugi wa Thiong’o. See also his earlier statement in support of an academic boycott of Israel. I am making a statement asking our membership to vote no on Resolution 2017-1 because it strikes me as so egregiously against everything the MLA represents. The resolution itself, that we refrain from endorsing “the boycott,” is a nonsense. As things currently stand, the MLA endorses no boycott. Within the framework of the MLA, therefore, there is nothing from which to refrain. Why are we having a vote at all on something non-existent? That we have supported boycotts and other forms of “political” action in the past does, however, show that every space possible must always be left open for debate within the MLA. To assert, as this Resolution does, that the one case preemptively never open for debate is that of Israel is simply to put the MLA on public record as endorsing some special status for Israel. Whatever one may think of the merits of BDS in particular (as a political intervention on behalf of academic freedoms the MLA most definitely claims to further) and of the MLA’s political role in general, such an endorsement surely exceeds any conceivable MLA interest. Does the MLA really wish to go on record as promoting Israeli academics’ freedoms while denying those of Palestinian academics? Click this link to VOTE NO on Resolution 2017-1. Voting on MLA Resolutions: April 19-June 1. 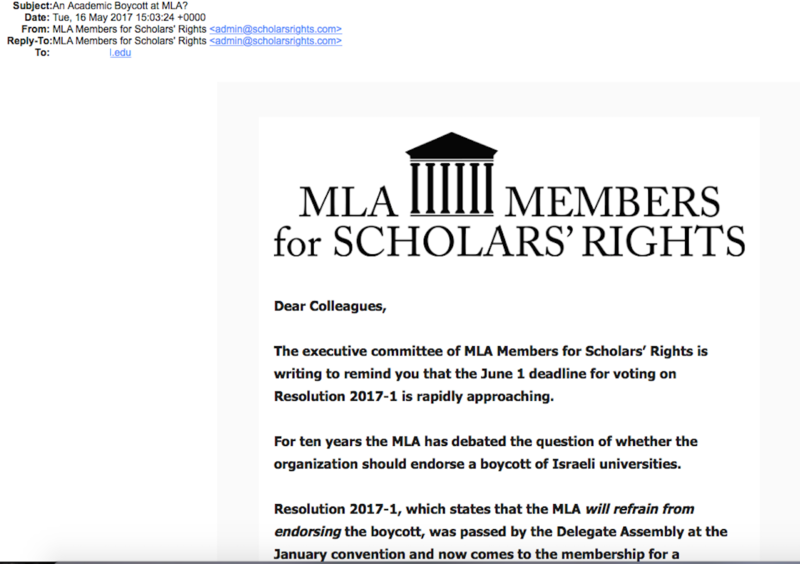 After three years of unprecedentedly open debate, the membership of the Modern Language Association’s (MLA) membership is finally voting on the Palestinian call to endorse a boycott of Israeli academic institutions. Voting continues through May. Unlike other organizations that have considered the issue, however, the MLA is not voting on whether or not to boycott. Instead, we are voting on a resolution (2017-1) that would commit the association not to endorse the boycott, even though a pro- boycott resolution—having been rejected by the Delegate Assembly in January—is no longer even on the table. To resolve not to endorse a non-existent resolution may seem a somewhat redundant exercise. But proponents of 2017-1 hope that passing their resolution will be the final nail in the coffin of a national movement for academic boycott—a movement whose capacity to rise from setbacks stronger than before has proven quite remarkable. They seek to close off debate on the issue within the MLA permanently, and by doing so, to send a signal to other associations that the matter is settled. As noted elsewhere on this site, Resolution 2017-1, which was proposed by Russell Berman (Stanford University) and Martin Shichtman (Eastern Michigan University), aims to shield Israel from institutional critique by delegitimating the Boycott, Divestment, and Sanctions (BDS) movement and discrediting advocacy in support of Palestinian human rights. Voting on MLA Resolutions closes June 1. Throughout the month of May, members of the Modern Language Association, the largest professional society of humanities scholars in the United States, will be voting on a resolution which—in contrast to other scholarly associations—seeks to ban the association from endorsing of the Palestinian call for a boycott of Israeli academic institutions. The Resolution was passed by the Delegate Assembly, the representative body of the membership, in January 2017, and now goes to the full membership. As many critics of the resolution have noted, it seems odd to put forward a resolution banning endorsement of a boycott resolution that is no longer on the table; it is equally odd to seek to close off debate on the issue in the name of preserving dialogue, as the resolution under consideration does. It is, effectively, an assault on MLA members’ freedom of speech, aimed at silencing the Palestinian struggle for justice and emancipation. During the 1980s, to its undying disgrace, the MLA rejected a resolution that would have supported the divestment and boycott movement against South African apartheid. 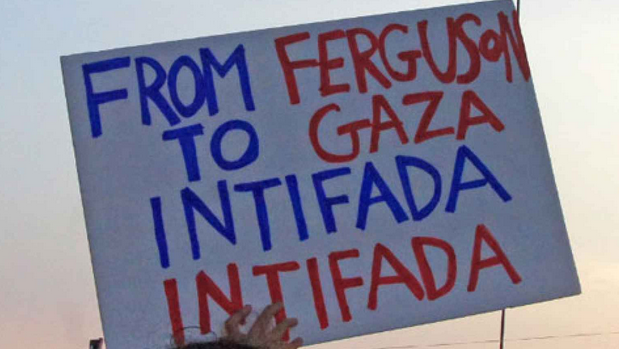 In this essay, formerly South African scholar and MLA member Derek Attridge affirms the value of academic boycott in that struggle and points to the connections between the South African divestment campaign and the current BDS campaign. Below is Fred Moten’s statement against MLA Resolution 2017-1. Fred Moten is Professor of English at the University of California, Riverside, where he teaches courses and conducts research in black studies, performance studies, poetics and literary theory. He is author of In the Break: The Aesthetics of the Black Radical Tradition (University of Minnesota Press, 2003); Hughson’s Tavern (Leon Works, 2009); B. Jenkins (Duke University Press, 2010); The Feel Trio (Letter Machine Editions, 2014), which was a poetry finalist for the National Book Award and Los Angeles Times Book Prize and winner of the California Book Award for poetry; The Little Edges (Wesleyan University Press, 2015), which was a finalist for the Kingsley Tufts Poetry Award and The Service Porch (Letter Machine Editions, 2016), A Poetics of the Undercommons (Sputnik and Fizzle, 2016) and a three volume collection of essays whose general title is consent not to be a single being (Duke University Press, 2017, 2018). Moten is also co-author, with Stefano Harney, of The Undercommons: Fugitive Planning and Black Study (Minor Compositions/Autonomedia, 2013) and, with Wu Tsang, of Who touched me? (If I Can’t Dance, I Don’t Want to be Part of Your Revolution, 2016). Most folks who refuse to answer the call for solidarity that will, in the first instance take the form of boycott of, divestment from, and sanctions upon Israeli academic and cultural institutions, don’t dispute the facts. A few do, but one generally feels it necessary to respond to them in the same way that you would respond to anyone who denies conquest. When I say anyone I’m not thinking of any imperial nation or corporate entity; I’m thinking of any child who blatantly takes something from another child they think of as other, or as weaker or, simply, as someone who has something they want and think they should have. You may or may not listen to their arguments about how their conquest and theft wasn’t really that; you may or may not be disgusted when they don’t even feel the need to make an argument; either way, in the end, you just make them give it back. The situation of Palestine, alas, isn’t so easy. When things are more complicated, when the task of reversal and repair requires great intellectual and moral energy, rather than counter-coercion, you have to think a little bit. There is a general history of brutality and its various justifications to unravel and to begin that work requires the cessation of business as usual. BDS, and the call for it, in the refusal to allow things to go on like this, provides the conditions and atmosphere for such thinking. The utter silence of MLA Delegate Assembly Resolution 2017-1 regarding the denial of Palestinian academic freedom is all but deafening. Moreover, the disingenuousness of its defense of debate with representatives of Israeli universities is manifest in the absence of any such defense of the right to debate the boycott within Israeli universities, which is now suppressed by the Israeli state. The promotion of teaching and research on language cannot be carried out by way of language’s repression. Resolution 2017-1 is as intellectually dishonest as it is morally obtuse. Vote No!